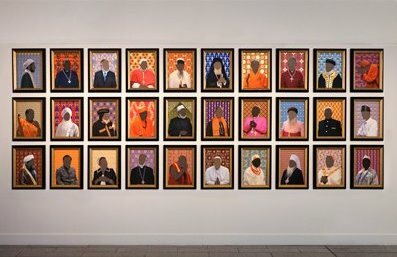 There are no facial features shown in Nicola Green’s The Encounter Series, a collection of portraits of global religious leaders, which include Pope Francis, the Dalai Lama, Archbishop Desmond Tutu, Archbishop of Canterbury Justin Welby, Pope Benedict XVI, Dr Mohammad Ali Shomali, former Grand Mufti of Egypt Ali Gomaa, emeritus Chief Rabbi Jonathan Sacks, Chinna Jeeyar Swamiji and Chief Nosakhare Isekhure. 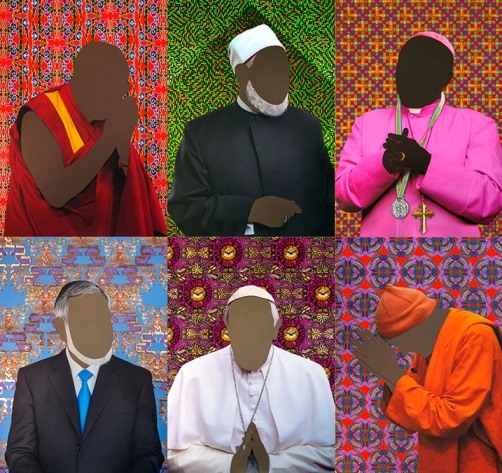 Despite this series being the first occasion that portraits of leaders of the world’s major religions have been shown together, with equal status and without any hierarchy, these leaders are faceless because Green has chosen to obscure the face and hands. The portraits derive from Green’s attendance, over the past decade, at private meetings and unreported small gatherings of religious leaders around the world. By sitting down together and considering possibilities for cooperation, dialogue and friendship, these religious leaders are taking us into a new era in interreligious relations. Often for the first time in history these religious leaders are leading the way towards a dialogue which respects and honours other religions, without compromising the truth of their own traditions. The historic significance of these meetings has not been recognised because there has been little or no reporting of them. Green has noted that all the religious leaders she has met share the feeling that no one takes much notice of them. Maybe her faceless portraits reflect this sense that they are overlooked and ignored. Many religions, however, encourage adherents to nurture humility in response to the divine. C.S. Lewis wrote that the humble are not thinking about humility, rather they are not thinking about themselves at all. It could be that Green’s religious leaders exemplify this understanding and that her faceless depictions reflect this. Green however has stated that were these portraits to have had facial features, the portraits would have been about the leaders as individuals as opposed to office holders. They all stand in a long line of those who held their particular office. Green is perhaps indicating that what each brings to the office as an individual is of less significance than the simple fact of their continuance of the office. 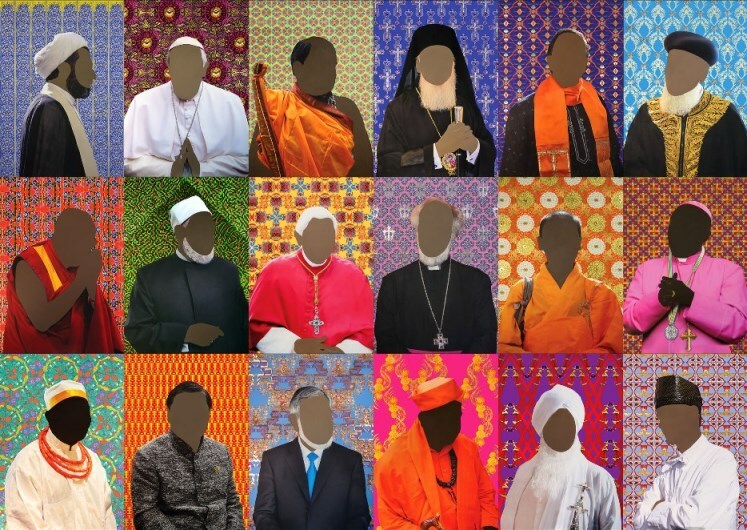 In contrast to the muting of the individuality of these religious leaders Green has set each portrait against a rich and detailed background symbolic of the traditions they bring to these shared meetings. Green has given each portrait ‘a unique patterned background particular to the faith of the sitter and the details of each encounter’. Aaron Rosen has written in the catalogue that: ‘Great care was taken to consider the significance of each motif, all of which incorporate symbolically rich imagery drawn from the scenes the artist observed. Sources range from religious leaders’ gowns, jewellery, and textiles, to ancient manuscripts in the Vatican and Lambeth Palace libraries, to a Torah pointer, a Zoroastrian tile, and architectural details from a Mosque and a Hindu Temple. These elements are transformed into deceptively simple graphic patterns. They are embellished by hand with 24k gold, silver and copper leaf and diamond dust.’ The beauty of these backgrounds indicates the richness of the traditions that these faceless individuals temporarily represent. These reflections set these religious leaders and their offices as being counter-cultural to a Western culture based on celebrity and individualism. However, the deliberately open-ended nature of Green’s portraits also means that ethnicity, culture, age, and gender are rendered indeterminate, turning identity into a fluid category defined in dialogue with others. Green suggests that when there are no facial features it is easier for viewers to see themselves in relation to these leaders, to make new connections between the sitters, and allow them to project themselves into unexpected roles. At its heart the Encounters project is an exploration of difference. It asks: how can people of different faiths, or none, communicate strongly held convictions, whilst respectfully allowing others to do the same? What can be gained from such encounters and how can we identify common goals whilst working from different perspectives? And how can deep religious commitments become an asset rather than an impediment to understanding and appreciating diversity? These are complicated, searching questions, yet Green invites viewers to think about their relationship to those we consider wholly ‘other’ to ourselves and how this, in turn, shapes our own identity. Green does so from her own Ashkenazi Jewish, Russian Orthodox and Anglican heritage. After the sudden death of her sister as a child she chose to explore atheism, followed by several different religions, returning in the end to her Anglican faith. Nicola Green: Encounters, 2018. The dimensions and media for each portrait are painting on giclée, with hand applied 24k gold leaf, on 308gsm Hahnemuhle H52 x W40 cm. © Nicola Green. Nicola Green is a London based artist and social historian. She gained unprecedented access to Barack Obama’s 2008 presidential campaign which culminated in her acclaimed work In Seven Days…, a series of seven large-scale silkscreen prints which were shown at The Metropolitan Museum in New York. Her access to the world’s major religious leaders is driven by her belief in the power of the visual arts to communicate moments of historical and global importance. She co-founded the Diaspora Platform, an initiative designed to deliver mentoring and professional development for emerging artists and curators from racially and culturally diverse backgrounds. This culminated in the critically acclaimed Diaspora Pavilion at the 57th Venice Biennale 2017.